In the last issue, I looked at Togo, where popular protests broke out in August 2017 against President Faure Gnassingbé, whose father Etienne Eyadéma Gnassingbé, was (until his death in 2005) the longest serving president in Africa. In this issue, I return to consider the situation in one country we have already discussed on several occasions, but where the President has at last come to the end of his long 37 year period in office – Zimbabwe. In previous issues we have examined the dynamics of political struggle in Zimbabwe and in issue 8 we noted that popular protest increased significantly during 2016 at the same time as the economy continued to deteriorate. Thirty-seven years ago, Robert Mugabe inherited a well-diversified economy with potential to become one of sub-Saharan Africa’s best performers. Today, Zimbabwe is the region’s crisis point, with real per capita incomes down 15 per cent since 1980. The queues to withdraw precious dollars from ATMs just hours after the army’s intervention on 15 November 2017 were just the latest illustration of a need for hard currency, reflecting grinding economic difficulties that go back years. Although in the early days after independence the Mugabe government was theoretically committed to Marxism-Leninism, it never paid more than lip service to the concept. It did, however, set up a plethora of state-owned enterprises. By the early 1990s, in the wake of the disintegration of the Soviet Union and its empire, the regime was shoe-horned by the IMF, the World Bank and western donors into a poorly designed and ineptly managed structural adjustment programme. Its designers believed that market and financial liberalization, plus civil service and public enterprise reform, would drive economic growth, with manufacturing as the lead sector. Many of the public sector reforms were stillborn, however, and de-industrialization accelerated. Industrial output today is less than 10 per cent of GDP, against a peak in the early 1990s of 25 per cent. Far from stimulating the economy as the donors and multilateral institutions promised, market reforms deepened the economic crisis, forcing Mugabe into ever more desperate measures. These included unbudgeted payouts to ‘war veterans’, compounded by Zimbabwe’s military foray into the Democratic Republic of Congo in 1998 to support the Kabila dynasty. Together, they helped precipitate the slide into currency collapse and hyperinflation of the early 2000s. The ‘war veterans’, encouraged by the regime which used them as a political vigilante force to implement some of its policies and to terrorize any opposition, were the vanguard of the chaotic land redistribution policy launched in 2000, ahead of elections in which many analysts insist Morgan Tsvangirai’s reformist Movement for Democratic Change won the vote but lost the count. To shore-up its rural support base the Mugabe government adopted a populist approach, playing to ZANU-PF’s historical strengths as a radical nationalist movement. It launched a programme of compulsory land acquisition and occupations of largely white-owned farms. Yet land reform accelerated economic decline exponentially with much of the redistributed land going to party cronies, while poorer farmers were deprived of the seeds, fertilizers and machinery necessary to make the land productive. As a consequence farm production collapsed and by 2008 output volumes were two-thirds below their peak levels in 2000. Real GDP plunged 45 per cent in the decade to 2009. In 2009, Zimbabwe was forced to abandon its currency — which had gone up in an inferno of hyperinflation — and to adopt the dollar as its principal means of exchange. The enforced dollarization stabilized the economy and led to an initial 40 per cent rebound in incomes, though these have since flat-lined. With no local currency, money supply became entirely dependent on inflows of dollars, in effect depriving the authorities of control over monetary policy. In a desperate measure to introduce liquidity, the government introduced ‘bond notes’ in 2016. These were theoretically backed by hard currency but quickly deteriorated in value. In the meanwhile, the underlying economic situation continued to deteriorate. In October 2016, the World Bank issued a report on Zimbabwe in which it stated that the economy was estimated to have grown by only 0.4 per cent in 2016, with agriculture having shrunk by 4.2 per cent, in part due to drought. There was concern that external payment arrears might lead to a further contraction in imports and a decline in GDP. In spite of export subsidies of $175m, the trade deficit now exceeds 10 per cent of GDP. Non-farm employment at about 850,000 is unchanged from the late 1980s, but the number of industrial jobs has fallen over the decades from more than 200,000 to 90,000. Today, the public sector, excluding the military — mostly teachers, health workers and civil servants — accounts for more than 40 per cent of formal employment. Wages are low and often unpaid for months. Money supply surged 36 per cent in 2016-2017 and the ‘bond notes’ plunged 80 per cent on the parallel market, threatening yet higher inflation. Already, at annualized rates, inflation is currently running at more than 14 per cent and the budget deficit is 12 per cent of GDP. The financial crisis continued to have a significant impact on incomes, while the drought of 2016 disproportionately affected the rural poor: the number of extremely poor people is expected to have increased from 3.16 million in 2015 to 3.28 million in 2016. Moreover, the number of food insecure people was considered likely to increase to over 4.4 million people by end 2016/early 2017. In Issue 8, we examined the role of the Tajamuka and ThisFlag campaigns as examples of popular movements of civil society that have protested repeatedly against the government, its handling of the economy and its repression of opposition, both on the street and online. ThisFlag has functioned as an avenue by which ordinary Zimbabweans can demonstrate their grievances against the government, with the group’s leader, Pastor Evan Mawarire, calling for Zimbabweans to engage in passive strikes and stay-aways to make their voices heard (ACLED Conflict Trends, September 2016). 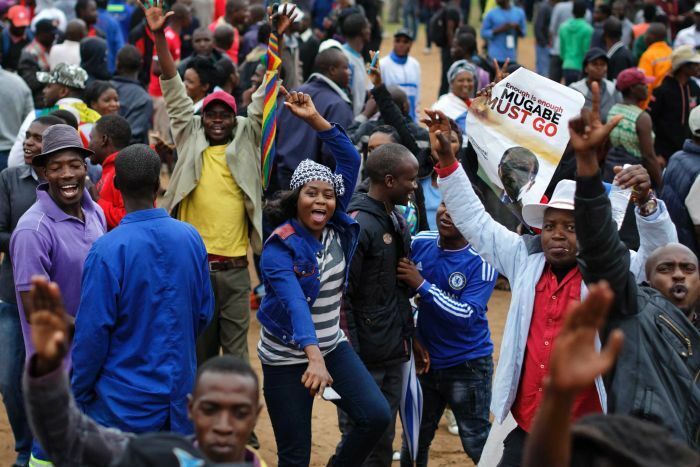 In contrast, the Tajamuka campaign was focused on forcing Mugabe to step down before the 2018 elections and became engaged in active protests and riots in Harare and Bulawayo. Protesting alongside these social movements was the National Vendors Union of Zimbabwe (NAVUZ) which also demanded an end to Mugabe’s administration and many other civil society organizations and associations. In the face of these civil society developments, the conventional opposition parties had become increasingly concerned about losing relevance as the vehicle for anti-Mugabe sentiment. They therefore formed an alliance and also engaged in widespread protest against the government. This alliance included notable former regime insiders and opposition politicians as well as Morgan Tsvangirai’s Movement for Democratic Change–Tsvangirai (MDC-T), former Vice-President Joice Mujuru’s Zimbabwe People First (PF) party, Tendai Biti’s People’s Democratic Party (PDP) and Elton Mangoma’s Renewal Democrats of Zimbabwe (RDZ). There was also evidence of increasing tension and factionalism within the ruling ZANU-PF as Robert Mugabe appeared to favour his wife Grace as his successor, and she gave all the signs of being prepared to step into his shoes. Grace Mugabe — 41 years younger than her husband — was once dismissed as a lightweight shopping addict. But she had become increasingly active in public life in recent years. Her ambitions were backed by the so-called G40, a group of young supporters that had earned a reputation for aggression, but also including some ZANU PF ministers. Born in South Africa, Grace was one of Mugabe’s secretaries when their affair began in 1987, and they had two children in secret before the president’s wife died in 1992. The couple married at a lavish ceremony in 1996 attended by Nelson Mandela, before having a third child. Grace was awarded a doctorate by the University of Zimbabwe, where her husband is chancellor, reportedly just three months after enrolling, and in 2014 became the head of the ZANU-PF party’s women’s wing. She showed her political mettle in 2014 with her campaign against then-vice president Joice Mujuru, who was a contender to succeed her husband. Grace launched sustained verbal attacks against Mujuru, accusing her of plotting to topple the president. Soon afterwards, Mujuru was ousted and later expelled from the ruling ZANU-PF party. Her confrontational approach and distant public image brought her little popular affection in Zimbabwe, but her supporters sought to popularize nicknames for her, like “Dr Amai (Doctor Mother)” and “Queen of Queens”. Over the last year or so, she had become a real contender for the presidency. This increased the tension at the top of ZANU-PF to the point where, eventually, in November 2017, a crisis point was evidently reached. In September 2017, a study by Research Advocacy Unit (RAU), titled ‘Zimbabwe since the elections in July 2013: The view from 2017’, noted a pattern of violence and intimidation under President Robert Mugabe. But when the crisis that many had predicted over the previous year or so eventually came, it was not in the form of a popular uprising against the endemic repression, violence and intimidation, or a concerted assault on the political dominance of ZANU PF by the ‘democratic forces’ and the political opposition, but as a direct result of infighting within the ZANU PF leadership over the succession to the presidency. On 10 October 2017, the Daily News published a major – and remarkably prescient – article under the heading: ‘ZANU-PF Infighting Risks Unrest, Instability’. It went on to report that ‘a respected think-tank’ had warned that ‘in-fighting at the top of Robert Mugabe’s ZANU-PF Party is spreading to elements of the bureaucracy and security establishment, and the harsh words being exchanged and the absence of democratic politics risk provoking a backlash that could bring great political instability and incidents of sporadic unrest’. With the two Vice Presidents at each other’s throats and First Lady Grace Mugabe now targeting Vice President Emmerson Mnangagwa, in a succession free-for-all. the conflict at the top of ZANU PF was now also spreading to the military and the security apparatus, posing ‘a significant stability threat’. There was increasing concern among many of the ZANU-PF leadership and also, it became apparent in November 2017, the army, that Grace Mugabe would be appointed as vice president at the ZANU-PF party congress in December. Arguably, it was the sacking of Vice President Emmerson Mnangagwa by Robert Mugabe – which appeared to support her ambitions – that prompted the military intervention on Tuesday 14 and Wednesday 15 November 2017. It is significant that not only was Grace Mugabe effectively sidelined by the army intervention but her supporters in the G40 were explicitly targeted by the military officers who announced on state TV in the early hours of Wednesday that they would bring the ‘criminals’ supporting the Mugabes to justice. At night on 14 November 2017, the military seized the radio and television operations of the Zimbabwe Broadcasting Corporation (ZBC) and by the next morning the world woke up to the news that the top officers of the Zimbabwe Defence Forces (ZDF) had intervened to place President Robert Mugabe in custody. An army spokesman, Major General Sibusiso Busi Moyo, read a statement in the middle of the night which claimed that the intervention was not a military takeover of government but was designed to respond effectively to ‘a degenerating political, social and economic situation in our country which, if not addressed, may result in violent conflict’. General Moyo explained that President Mugabe was being detained for his own protection and the military were ‘only targeting criminals around him who are committing crimes that are causing social and economic suffering in the country’. By the end of the day, Robert Mugabe was said to be under house arrest and his wife Grace Mugabe was said to have fled the country, perhaps to Namibia; also some former ministers had been arrested, and the former Vice President, Emmerson Mnangagwa, whom Mugabe had sacked at Grace’s instigation only a few days before, was nominated by the remaining ZANU-PF leadership to be acting or interim president. Civil society organizations asked the military to ensure restoration of the constitutional order and an inclusive process to resolve ‘Zimbabwe’s political and socio-economic problems’. These organizations that signed the press release numbered 115 in all and ranged widely across the spectrum of civil society, including women’s groups, church organizations, youth groups, community associations, human rights groups, and trade and professional associations. They called for ‘the peaceful and constitutional resolution of the situation’ and an ‘immediate return of Constitutional order and democracy in Zimbabwe’. They expressed the view that ‘the solution to Zimbabwe’s socio economic and political problems should be a product of an inclusive all stakeholder process’, thereby staking an important claim to involvement in any kind of ‘settlement’. They called for President Mugabe to step down and ‘pave the way for an inclusive, all stakeholder process to determine the future of Zimbabwe’. They ‘implored’ the Zimbabwe Defence Forces to uphold, defend and respect the Constitution, and ‘demanded’ that they issue a clear and quickly implementable roadmap to restoring constitutional order in Zimbabwe. They also called on the Parliament of Zimbabwe ‘to uphold and fulfil their constitutional obligations by: i) Creating conditions for the swift realignment of key laws to the constitution including the Electoral Act paving way for the conduct of credible free and fair election in 2018; ii) Repealing legislation that they considered diluted progressive provisions of the constitutions, such as the Cyber-Security Act; iii) Immediately discarding Constitutional Amendment Bill No.1 of 2017 to safeguard the independence of the judiciary; iv) Restoring citizens freedoms of assembly and speech by amending restrictive laws such as the Public Order and Security Act (POSA) and Access to Information and Protection of Privacy Act (AIPPA); v) Liberalizing the media space; and vi) Ensuring civil servants’ neutrality in the political processes in line with the Constitution. Clearly these civil society organizations were concerned that the army’s intervention and control of the political situation would be prolonged and effectively constitute a military coup; they were also concerned that any regime that follows the departure of Robert Mugabe as President might prove to be little different – apart from a change of President and shift in the balance of political forces among the top echelons of the ZANU-PF. The war veterans, who have in the past often been the most loyal supporters of President Mugabe, also made it clear that they believe he should now go, and called for him to be impeached. Some, like War Veterans Association Chair, Christopher Mutsvangwa, even called on South African President Zuma as Chair of the regional body SADC to speed up the process: ‘we want to see the back of Mugabe’, he said. The party elite of ZANU-PF met at once to discuss the situation and it rapidly became clear that those present (some of Mugabe’s supporters were not able to participate because they had been arrested) were unanimous in wanting the President to step down. He was officially removed from his position as Party leader, at a special session of the ruling party’s central committee, to be replaced by his former trusted lieutenant former Vice President Emmerson Mnangagwa, whom he had sacked only the previous week. Over the weekend of 18-19 November, there were mass demonstrations as tens of thousands of people came onto the streets of Harare and other major towns across Zimbabwe to celebrate what appeared to be the end of Mugabe’s 37 year long period in office, ripping down images of Mr Mugabe and brandishing signs calling for his wife, Grace, to be expelled from the ruling party. CNN News reported on Monday 20 November that ‘hundreds of thousands’ had come onto the streets, giving a popular endorsement of the action by the military, but also noted that ‘armored vehicles manned by soldiers were still stationed on some street corners’. On Sunday evening, 19 November, Robert Mugabe addressed the nation on television. He was expected, and had clearly been asked by his military ‘minders’ – who were present with him in the TV studio – to present his resignation. To almost everyone’s surprise, however, and to the evident consternation of the army officers present but off- camera behind him, instead of resigning, he embarked on a long and rambling speech, recognizing ‘that many developments have occurred in the party, given the failings of the past, and anger they might have triggered in some quarters’, but pledging to remain in office to undertake reforms. He even intimated that he planned to preside over ZANU-PF’s extra-ordinary congress scheduled for December 12-17. Moments after Mugabe’s address, war veterans’ leader Chris Mutsvangwa said he would lead public protests in the streets of Harare to call for his resignation or dismissal. Two senior government sources told Reuters late on Sunday night that Mugabe had agreed to resign but they did not know details of his departure. Whether this was the case or not, external pressures began to build. Representatives from South Africa had already travelled to Zimbabwe and on Monday 20 November, Zambian President Edgar Lungu sent former president Kenneth Kaunda (also 93 years old, like Mugabe) to Harare to try to convince Robert Mugabe to step down in a ‘dignified exit’. Internal pressure also began to rise as the ZANU-PF deadline of noon on Monday 20 November for Mugabe’s resignation passed. All ZANU-PF MPs were called together to Party headquarters to discuss the proposal for Mugabe’s impeachment. In the meanwhile, Mugabe, apparently unrepentant and reluctant to step aside as requested, apparently met with his Cabinet, suggesting that he might not be prepared to concede his position as President of the Republic of Zimbabwe even under extreme pressure. There was even speculation that he envisaged himself remaining in post at least until the December Party Congress. On Tuesday afternoon, however, as Parliament met to initiate impeachment proceedings, a short letter was sent which was read out by the Speaker. It confirmed that Robert Mugabe had, at last, resigned as President of Zimbabwe. The reaction from the public was immediate and almost universally joyful. There were celebrations from the crowds in the streets, and it seemed clear that, whatever their status or political persuasion, the people of Zimbabwe were pleased to see ‘the old man’ go, and looked forward to a new era of change. Precisely what change there will be remains less clear. The military that intervened in ‘a coup that was not a coup’, in mid-November 2017, presented itself throughout as merely facilitating a change of leadership, but the army has been less forthcoming as to its own anticipated future role. In a press release the Zimbabwe Defense Forces emphasized that it had the support of the business community and said it wanted to create ‘a peaceful, united investor-friendly and prosperous Zimbabwe’. It is not at all clear yet how far the army is prepared to pass the reins of government back to ZANU-PF, even if headed by a new leader. Emmerson Mnangagwa, the sacked vice-president of ZANU-PF, who is Mr Mugabe’s most likely successor, and is now the interim President and acting leader of ZANU-PF, is clearly ambitious, and unlikely to cede power easily. He has worked behind the scenes over the last few months to support the aborted Lima process, through which the government had hoped to clear up longstanding debt arrears, opening the way to new multilateral funds and, potentially, more foreign investment – but to many was seen as a further and devastating structural adjustment programme. It is most likely that he will at least be the ‘face’ of the new government; but whether he will be able to maintain his position and continue to lead what has been in many ways a one-party state through the dominance of the ZANU-PF, remains to be seen. The December Congress of the Party will be decisive in either consolidating his position or undermining it. The role of the veterans’ association, which moved decisively against Robert Mugabe over the last two weeks, also remains to be seen. The political opposition clearly hopes that it will be possible for Zimbabwe to return to genuine multi-party politics and that the period before the forthcoming elections will give an opportunity for open and democratic debate, and for the rights of assembly and the expression of different political views to be upheld. Finally, the many elements of civil society hope for an opportunity to express their demands for a new direction for Zimbabwe’s political, social and economic trajectory in an atmosphere of openness and optimism. No doubt, the country will be inundated with offers of ‘rescue packages’, from a variety of international donors and companies. Given the devastating impact since 1980 of these external loans and debts on Zimbabwe’s development, such interventions should be resisted in favour of a more self-reliant strategy for sustainable development. This, however, is unlikely to happen. Tendai Biti, for example, the former socialist lawyer and leading MDC politician, who was finance minister from 2009 to 2013, has suggested that the economy could quickly recover if it could attract foreign investment and reinsert itself into the international economy: ‘look at the way we bounced back in the government of national unity’, he said, referring to the recovery from hyperinflation after 2009. ‘We can build a $100bn economy in under 15 years and have a growth rate of 7 per cent per annum’. For the moment, however, the ordinary people of Zimbabwe, who have experienced decades of repression and hardship, are rejoicing and are optimistic; very soon, however – indeed even as this is being written – there will be a renewed struggle for the future of Zimbabwe.